I'm rarely one to stray away from my favourite NARS Sheer Glow foundation, but after hearing so much about the Milani Conceal + Perfect foundation (especially from the incredible Tati), I had to pick it up when I was in the US. I actually think Milani is more readily available now from Beauty Bay, so us UK beauty lovers can pick it up! You can get this foundation for £10 here. First of all, one issue with this foundation is the shade range. I have the lightest shade, and it is still too dark for me without any fake tan on. It is very yellow toned, which generally I prefer, but it really doesn't look right when I don't have a tan. The shade matching may be a bit of an issue as it's only really available online too, so definitely do your research. If you're around my skin tone then this shade 01 should be fine. That's my main gripe with it, but on the other hand, it does offer a range of darker shades which is great as I know it can be quite difficult to find darker shades in drugstore foundations. The coverage of this foundation really is very full coverage. If you're not used to having a lot of makeup on, this really won't be for you, but I have to say I love it. It does claim to be a 2-in-1 foundation and concealer, but generally I like to use a lighter shade of concealer, so I do still use it to highlight, but I don't really need any other concealing. The finish is fairly matte, and I find the longevity is pretty good - I do prefer to use a primer along with my foundations anyway, but it wears really nicely, and doesn't go shiny or patchy throughout the day. And for £10, it's definitely worth giving a go if you can find a shade for you! 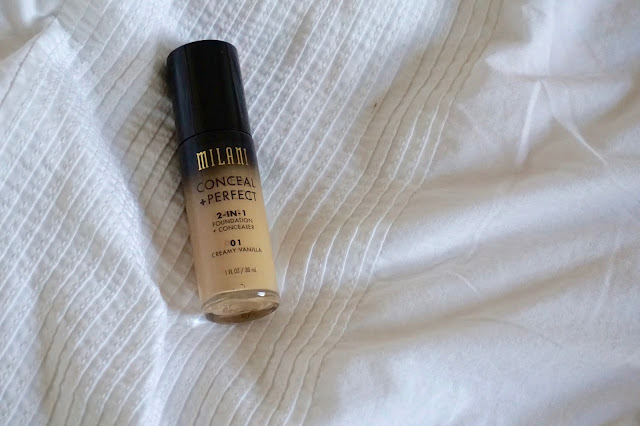 Have you tried this foundation - or anything from Milani? Let me know in the comments.